A screen shot of the live updates at the time this entry was posted (1-11-2011). On Monday the United Nations officially declared a baby born in the Philippines as the world's 7 billionth occupant. According to the statement, Danica May Camacho was born just after midnight Monday at a local hospital in Manila. After declaring her the honorary 7 billionth inhabitant of the planet, U.N. officials presented the baby's parents with a scholarship for her education and a financial package to help them open a general store. 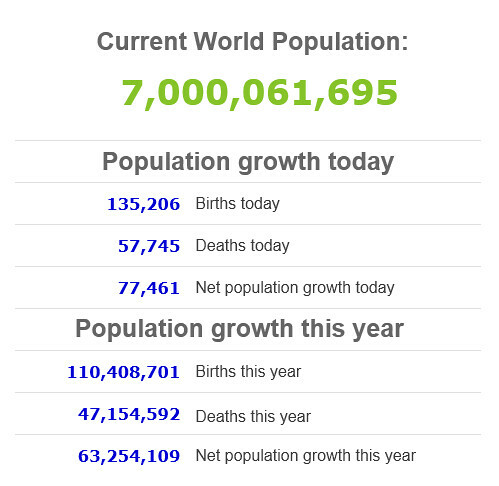 The world's population has doubled in the past 50 years, and the 6 billionth occupant was officially born Oct. 12, 1999, in Bosnia - just about 12 years ago. 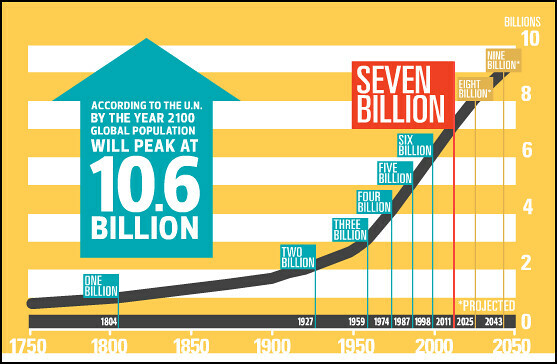 As shown in the graph below, the world population is increasing at accelerated pace since 1950 and if this trend continues we will have a population of 10 billion by 2050. It is inevitable there will be an increase in the demand on the world's natural resources and that increase would be exponential. Many of these are already under tremendous pressure from current rate of depletion. Essential things like water, coal, oil and gas, phosphorus (for plants to grow), rare earth elements such as neodymium (e.g. for electricity generation, etc) will become scarce and as smart as we humans are, there will certainly be a melt-point somewhere not too far away from now where the graph will plot into a plateau. In short, looking from science point of view, how well we cope with increasing population depends much on how well we manage our WATER, FOOD and ENERGY. So, as you think of water, food and energy, think green. Act and treat our earth with our children's children in mind. so, the war minght decrease ours population dramatically really needed? thats what New Word Order thinked. But why should human resort to war? Are humans going backward to the instinct of an animal on survivality?